Thanks for the common sense. You're right on track. Everyone is different, both in how much it bothers them, and in how they can realistically express (or not!) themselves. Whether that's going out enfemme every day, once a week, once a month, once a decade, or never. Indeed, *strength of the desire for cross-gender expression* (i.e. 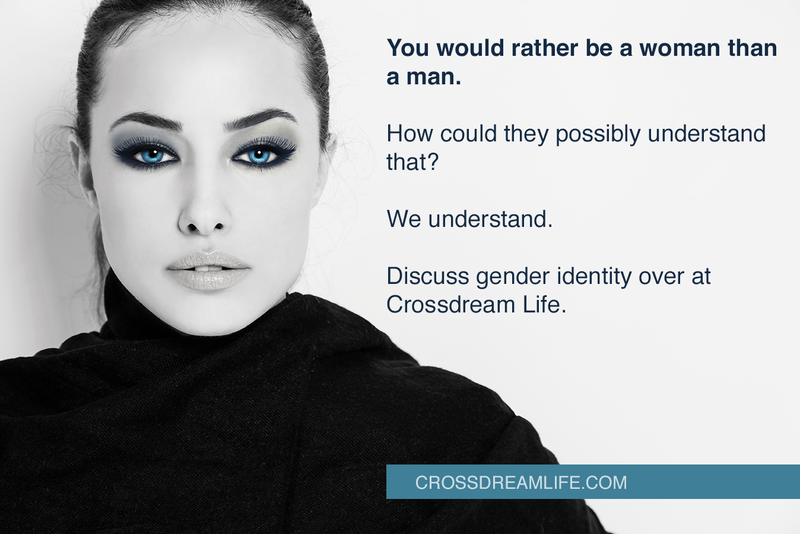 how much it bothers them) can be seen as a continuum or spectrum which includes crossdreamers, crossdressers, transgenderists, or transsexuals. Really, though, you have the most interesting blog I've seen in a long time. Aaaaah, sorry about that! Link fixed! In any case to summarize my thoughts regarding your introductory remarks; I would state that our loved ones, though playing an enormous role in our lives, are not the deciding factor in how we deal with our autogynephilic emotions. Only those who have these emotions can resolve them by looking reality squarely in the face, being truthful with oneself and “than” juxtaposing those conclusions with the life they live with their loved ones. It should never be an acquiescence to appease a relationship, but an honest and heartfelt understanding of we are first and foremost, otherwise we would simply be living a falsification of the reality of what marriage was all about. At any rate, I appreciate our discussions Jack and welcome the acknowledgment of my thoughts on “Crossdreamers” very much. However, being the verbose person I am, I think it best, owing to the visual space available on your site for longer comments, to continue this discussion over at Imitations of Reality which I will do with the next few days. You are right. Thank you for letting me know. I have retraced the pages over at the Way Back Machine and included links to that archive.